This talk explores Pierre Huyghe’s major work Untilled (2011–2012), an outdoor installation which the French artist created for Documenta 13. Using as our compass his working notes, seldom made public, we shall be finding our bearings in a piece designed to develop its own vitality. Built on a compost site and open to the wind, Untilled has a very specific form: it plays with the living world and the dead, the natural and the artificial, the animal and the human, and with rhythms and times. A real dog with one foreleg painted pink, a sculpture flanked by a hive of bees – Untilled forges strange alliances by means of shifts, separations and collapses. In the course of our exploration, we shall bring in elements of art history and contemporary philosophy, in order to highlight some of the questions that Untilled poses our present, and the promises that it carries. The discussion will also extend to other major works by Pierre Huyghe, such as The Host and The Cloud (2009–2010) and After ALife Ahead (2017). Alive entities and inanimate things, made and not made. Courtesy the artist ; Marian Goodman Gallery, New York, Paris; Esther Schipper, Berlin. A doctoral student attached to the Institut ACTE (Arts, Créations, Théories et Esthétique – CNRS / Panthéon-Sorbonne University – Paris I), Flora Katz is also an art critic for publications (on Pierre Huyghe, Rochelle Goldberg, Eva Barto, Korakrit Arunanondchai, and Jessica Warboys, this last with Tristan Garcia) and magazines (Mouvement, Artpress). She also develops curatorial projects in France and abroad (Fondation Lafayette Anticipations, DOC, Orange Rouge, Fondation d’entreprise Ricard, etc.). 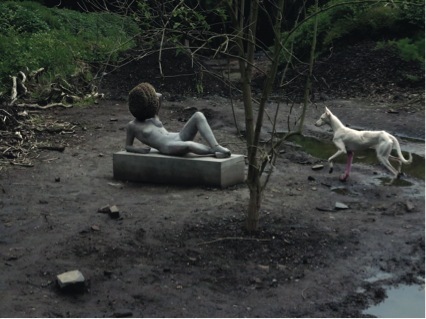 >> “Pierre Huyghe, Untilled” is the first talk in a series of lectures entitled “Exhibiting the Living World”. It will be followed by a talk on Pawel Althamer in 2018. The exhibition La Vie Simple – Simplement la vie / Songs of Alienation concludes with an installation by Pawel Althamer outside on the Fondation patio. It is the materialisation of a fantastical vision of post-apocalyptic nature, cohabited by artificial plants, living plants and parrots. The presence of this imaginary nature in the heart of the city offers us an opportunity to reflect on the way in which the living world is perceived by institutions and artists.